In the Watergate Building on June 17, 1972, lights go on and four burglars are caught breaking into the offices of the Democratic National Headquarters. That night triggered revelations that would eventually drive a U.S. President from office. Washington Post reporters Bob Woodward (Robert Redford) and Carl Bernstein (Dustin Hoffman) grabbed the initial break-in story and stayed with it through doubts, denials and discouragement. All the President’s Men is their story. Directed by Alan J. Pakula (Sophie’s Choice) and based on the best-selling Woodward/Bernstein book, the film was nominated for eight Academy Awards (including Best Picture), winning four, including Best Supporting Actor for Jason Robards’ brilliant performance as Post editor Ben Bradlee. 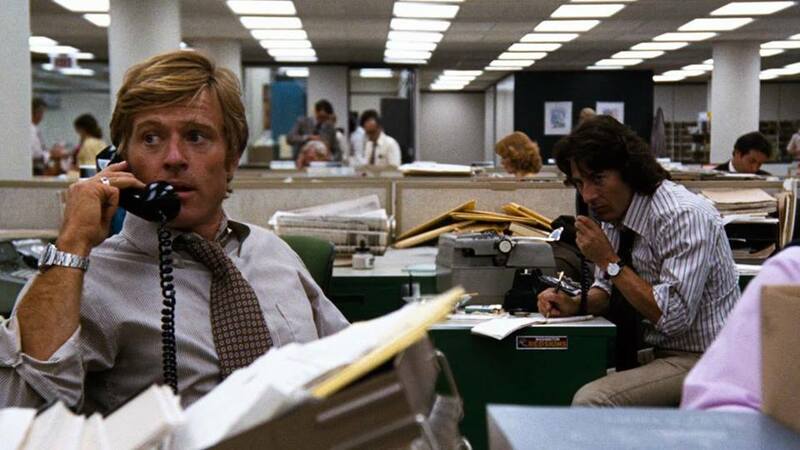 This memorable true-life movie also expertly explores the inner-workings of a working daily newspaper, where the mission is to not only get the story—but also to get it right.